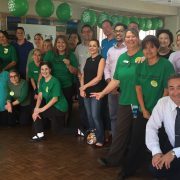 Sales & Marketing director Dragan Jancic had great pleasure representing Vitalcare at the Falls Prevention Awareness Program event at Wesley Tebbutt Dundas part of the Wesley Mission Group. Dragan meet with many of the staff and noted that it was an absolute pleasure to take part in such a great event with such a capable team. Over the last 30 years, Vitalcare have provided many Wesley Mission facilities with their Nurse Call, Fall prevention and messaging alert systems over the years, and these systems combined have greatly contributed to a decline in the falls of residents from various Wesley Mission Facilities. Vitalcare look forward to continually improving the health and wellness of all residents by assisting Staff with simple to use and effective technology capable of making a real difference in the lives of residents.